A mammalian protein similar in structure to the active component of honeybee royal jelly—the queen-making goop that helps worker bees raise a new egg-laying diva for the hive—functions as kind of a fountain of youth for mouse embryonic stem cells, according to researchers at the Stanford University School of Medicine. The protein causes the cells to remain pluripotent, meaning they can become any cell in the body, under conditions that would normally trigger them to develop into specialized cells. The unexpected finding is likely to fan the flames of a millennia-old debate as to the regenerative power of royal jelly. More importantly, the discovery reveals new pathways to pluripotency and suggests novel ways to keep stem cells in a state of suspended animation until needed for future therapies. "In folklore, royal jelly is kind of like a super-medicine, particularly in Asia and Europe," said assistant professor of dermatology Kevin Wang, MD, Ph.D., "but the DNA sequence of royalactin, the active component in the jelly, is unique to honeybees. Now, we've identified a structurally similar mammalian protein that can maintain stem cell pluripotency." Wang is the senior author of the study, which was published Dec. 4 in Nature Communications. Associate Professor of surgery Derrick Wan, MD, is the lead author. Royal jelly is a critical component in the strict hierarchical structure of the honeybee hive. Under normal conditions, a single queen lays fertilized eggs that develop into female worker bees. These worker bees slave away collecting pollen and nectar, building the honeycomb, laying unfertilized eggs and tending to larvae. In contrast, the drones loll about the hive, rousing themselves every so often to meet up with other drones at designated "drone congregation areas" where they hover until a new queen flies by and incites a mating riot. Eventually, a new queen is needed for the hive when an old queen dies or the hive grows too large and needs to split into two. In this case, the worker bees select a few female larvae to nurture exclusively with royal jelly—a viscous, slightly acidic substance composed of water, proteins and sugars—during their development. All larvae are fed with royal jelly for the first few days after hatching, but worker larvae are quickly switched to a combination of royal jelly, honey and a pollen concoction known as "bee bread." Exactly how a royal jelly diet stimulates the formation of a large, fertile queen rather than a lowly worker bee has remained elusive. But humans quickly decided that what's good for the queen must be good for them. Although royal jelly has been suggested to have effects on cholesterol levels, blood pressure, nervous system and hormonal activity, it has not been approved by the Food and Drug Administration for medicinal use. Wang wondered how a royal jelly diet could trigger the extreme differences seen between queen bees and the much smaller workers. After all, the two insect castes share an identical genome. "I've always been interested in the control of cell size," Wang said, "and the honeybee is a fantastic model to study this. These larvae all start out the same on day zero, but end up with dramatic and lasting differences in size. How does this happen?" 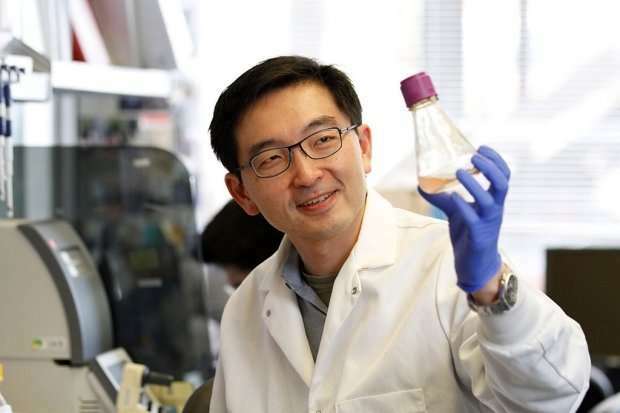 Wang and his colleagues focused on a protein—appropriately called royalactin—that previously had been suggested to be the active ingredient in royal jelly. They applied royalactin to mouse embryonic stem cells to study the cells' response. "For royal jelly to have an effect on queen development, it has to work on early progenitor cells in the bee larvae," Wang said. "So we decided to see what effect it had, if any, on embryonic stem cells." Embryonic stem cells are potent, but fickle. When grown in the laboratory, they often want to abandon their stem cell state and differentiate into specialized cells. Researchers have devised ways to keep the cells in line by adding molecules that inhibit differentiation to the environment in which the cells grow. To their surprise, Wang and colleagues found that the addition of royalactin stopped the embryonic stem cells from differentiating, even in the absence of the inhibitors. "This was unexpected," Wang said. "Normally, these embryonic stem cells are grown in the presence of an inhibitor called leukemia inhibitor factor that stops them from differentiating inappropriately in culture, but we found that royalactin blocked differentiation even in the absence of LIF." The cultured LIF-free cells grew happily for up to 20 generations without losing their "stemness," the researchers found. Additional experiments showed that the royalactin-treated stem cells exhibited gene-expression profiles similar to stem cells grown in the presence of the inhibitors, churning out proteins known to be associated with pluripotency while tamping down the production of proteins important for differentiation. Yet the cells' response was confusing because mammals don't make royalactin. For answers, the researchers turned to a database that infers the three-dimensional structure of proteins. Like a lock and key, many proteins work by fitting precisely together with other proteins or biological molecules. The scientists wondered whether there might be another protein in mammals that mimics the shape, but not the sequence, of royalactin. Wang found a mammalian protein called NHLRC3 that was predicted to form a structure similar to royalactin and that was produced early in embryonic development in all animals from eels to humans. Furthermore, they discovered that NHLRC3, like royalactin, was able to maintain pluripotency in mouse embryonic cells, and that it caused a similar gene-expression pattern in them as in those cells exposed to royalactin. They renamed the protein Regina, which is Latin for queen. The researchers next plan to investigate whether Regina has any therapeutic value in wound healing or cell regeneration in adult animals. They also hope their finding will help researchers discover more or better ways to keep embryonic stem cells pluripotent when grown in the laboratory. "It's fascinating," Wang said. "Our experiments imply Regina is an important molecule governing pluripotency and the production of progenitor cells that give rise to the tissues of the embryo. We've connected something mythical to something real."